Acronis Recovery for SQL Server ensures that critical database functions can be restored or backed up with minimal obstruction to SQL Server performance. Acronis Recovery for MS SQL Server is a backup and recovery solution with database backup technology that reduces disaster recovery time. Acronis Recovery for MS SQL Server ensures that critical database-driven business functions can be restored with minimal obstruction to SQL Server performance. Acronis Inc. designed the product so it can create backup images of databases that are up to 90% smaller than the originals, and Acronis Recovery for MS SQL Server allows database backup to an FTP server without any staging steps. This makes for a fast and reliable way to move backups offsite, and it presents the option to create a comprehensible disaster recovery (DR) plan to assist with one-step or automated recovery. 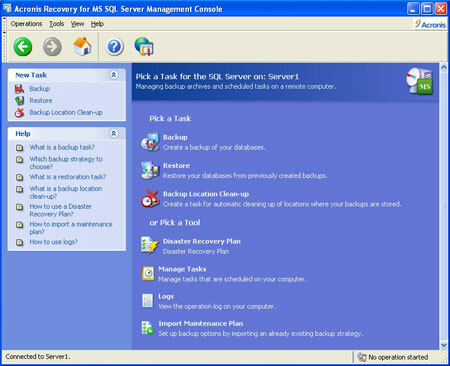 Figure 1: A screenshot of Acronis Recovery for SQL Server. Microsoft SQL Server versions 7.0 to SQL Server 2005, including SQL Server 2000 Desktop and SQL Server 2005 Express support Acronis Recovery for MS SQL Server. Acronis Recovery for MS SQL Server Management Console: A wizard-driven tool that manages data backup/restore on the local network from a single location. Acronis Recovery for MS SQL Server Agent: Enables local and remote management from the Management Console. Acronis Recovery for MS SQL Server Assistant: Helps users define the best strategy and backup-creation parameters through a series of proposed questions. System requirements: Microsoft Windows-compatible hardware; Windows 2000, Windows XP or Windows Vista; Windows Server 2003. Pricing: Acronis Recovery for MS SQL Server is $499 per license.